Her having a bigger role both gives me hope, but it also makes me afraid haha. She could either give a very nuanced performance or fail at portraying the complexity of her character and come across as flat, as she has in her other roles except for Game of Thrones, but even there she’s outshone by everyone else. But of course, the writers could mess up her character as well haha, and just don’t give her enough to work with, as they did in Apocalypse. I’m curious to find out. Hopefully, it’ll be a good sendoff to the series! I hope they do the character and the storyline justice. I wasn’t a big fan of the Apocalypse film, it was a bit of a jumbled mess, hopefully Dark Phoenix will redress the balance a bit and bring this film series to a good conclusion. This looks way intense. I can’t wait to see this movie. I’m sure they will. I’ve enjoyed most of the X-Men films, so will be good to see this film series get a good send off and wrap the storylines up properly. Yeah I feel like after this, we’ll get more interesting X-Men stories. I heard we’re getting a Gambit and New Mutants movie. I’m sure it will lead to even bigger things for the X-Men films. I think Gambit and New Mutants movies were planned, not sure if they are still going ahead now though. Either way, I’m sure those characters will appear at some point. I am looking forward to seeing the X-Men again. It feels like it’s been a long time since I seen the previous movies. The team are amazing like Avengers. I am curious about seeing Gambit. I heard he was pretty helpful in the series and I hear in the cartoons he is cool. I hope to see this movie. I feel like this will be eve greater than X-Men 3. Yes, Gambit has been a key character in the comics and the cartoon sereis as well. Hopefully one day we will see him make the move to the big screen as well. Dark Phoenix looks like it will give all the principle cast major roles, and I’m sure their showdown with Dark Phoenix will be pretty spectacular. I hope he makes a cameo appearance in the movie. He is interesting character. It looks like they brought the cast from the previous X-Men for Dark Phoenix. It’s interesting that the movie is not called X-Men: Dark Phoenix. We shall have to wait and see. Yes, I thought this film would have been called X-Men Dark Phoenix as well, strange they didn’t go for that really. Scratch out that last sentence I said. X-Men Dark Phoenix will probably be a summer’s biggest blockbuter. That’s ok. Yes, I hope Dark Phoenix does well. I think people will be interested to see how this era of X-Men movies concludes. If that’s true, I guess Marvel-Fox might be going to a new direction in the X-Men universe. I guess that explains why we have upcoming titles, for now, called Gambit and New Mutants. I bet this new change is going to be beyond the X-Men team and focus on the characters instead. Agreed, I thought this trailer did a good job of showing that it’s going to be doing its own spin on the Phoenix saga. I’m definitely looking forward to seeing it. There’s definitely going to be a lot of action here! 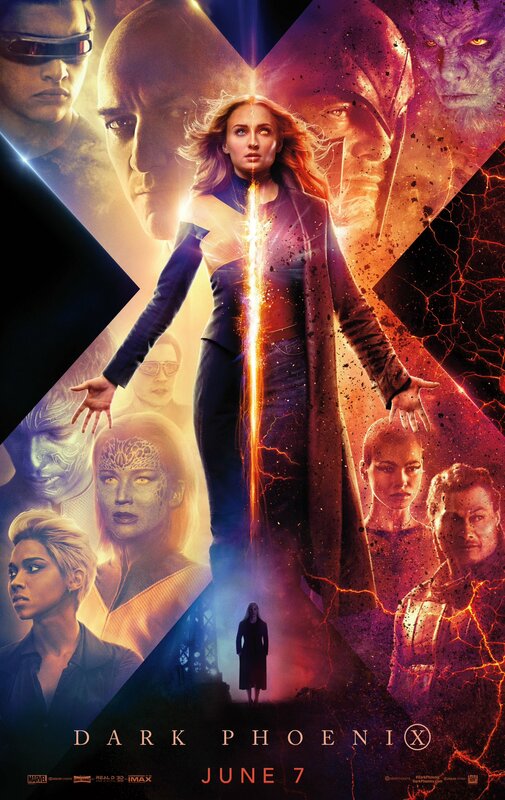 I’m avoiding this trailer to be honest Paul due to spoilers but I did enjoy the first trailer and couldn’t understand the hate Dark Phoenix is getting. All the controversy surrounding the reshoots is perhaps a little troubling but I’m still want to give it the benefit of the doubt – I’d just like to see the Fox era of X-Men to have a decent send-off (even if it doesn’t end up being spectacular). It looks like it could be good, but I wouldn’t go so far as to say I’m excited to watch the movie. I wasn’t expecting much from Dark Phoenix at all originally, but I’m looking foward to it more now. Looks a lot better than Apocalypse was, so fingers crossed. Apocalypse really should have been a trilogy. That’s the only way you could do a villain like Apocalypse justice in movie form. I imagine it like this; you don’t even see Apocalypse in the first movie. Focus the first movie on properly introducing Angel as an actual character, as well as Mr. Sinister. At the half-way point, Angel loses his wings and turns to Sinister for help. Archangel ends up being the main threat to the X-Men in that movie. The climax introduces the rest of the horsemen. The second movie starts with Apocalypse’s backstory and the general history of the horsemen. But you don’t properly see him until about half-way in. By that point, Archangel is starting to switch back to the X-Men’s side. Apocalypse introduces the new horsemen of death at the same time as he introduces himself. It’s not until the third movie though when you learn the real scope of Apocalypse’s power and his plans. And it’s a big enough threat that it forces the X-Men, Magneto’s brotherhood and even the Hellfire club to team up against him. That would certainly have been a better way of doing the Apocalypse storylines. I’d really like to see Mr Sinister in a movie as well, I prefer him s a X-Men villain to Apocalypse tbh. Apocalypse can be good with the right writer, but Mr. Sinister is more fun because of how wildly unpredictable he is. I agree, Mr Sinister has always been one of my favourite villains. Would be cool to see the Inferno storyline made into a movie one day, that was a great storyline as well. I haven’t read Inferno. I really should some time. Its a story were the Goblin Queen teams up with Mr Sinister to unleash hell on Earth, quite literally, and all the X-Men. Its one of my favourite X-Men storylines and say the first team up between Uncanny X-Men and X-Factor. I’d highly recommend it, think its available now in a trade collection, but I’m not 100% sure. Will have to check.